In many ways, the 73-year-old director looks sprightlier than he ever has. His enormous brown eyes are no longer hidden behind coke-bottle lenses (he only occasionally pulls out reading glasses while fumbling over some notes). 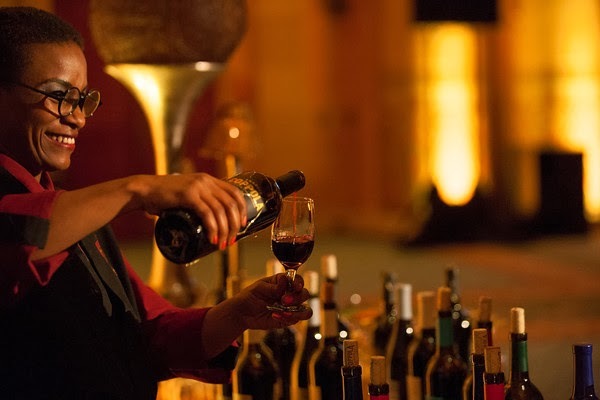 Though still a sturdy, imposing figure, he looks somewhat slimmer, or maybe it's the spring in his step as he approached a seat on the stage to sit down for an informal speaking engagement touted as a "celebration of wine, friends and family." Just about one hour earlier, the ballroom was filled with film fans, wine sellers and press, all flitting about from one to another of five tables to sample just about every varietal that Coppola's Napa Valley winery has to offer. Delicious finger food (from Atlanta caterers Affairs to Remember) like a grape rolled in blue cheese and pistachios or a chicken Wellington were paired with wines from Coppola's Director's Cut, Diamond Collection, Rosso Bianco, Sofia, and Votre Santé lines for everyone to enjoy. 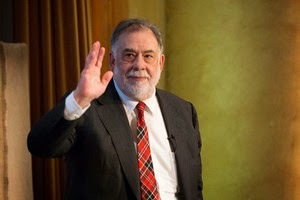 Now, Coppola was warmly greeting his audience, thanking them for coming before launching into a one hour discussion of his career and his life. 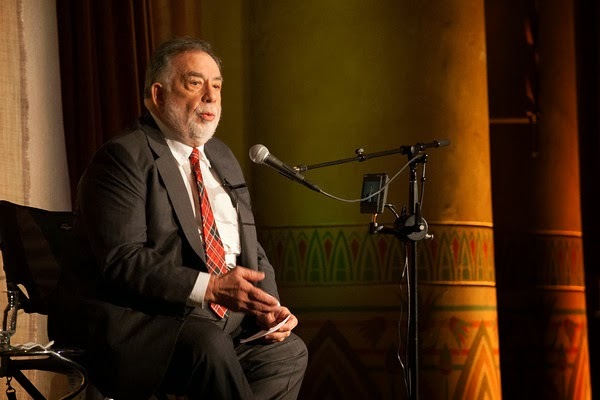 Not surprisingly, he was framing his story around the current crown jewel of his empire, the Francis Ford Coppola Winery and the involvement of his entire extended family in the enterprise. What's amazing is how his voluminous and celebrated filmography appear to have taken a backseat to all of the other endeavors that now make up the Coppola brand—restaurants, resorts, a literary magazine, a line of pasta sauces—all of which many may previously have been unaware of. Coppola spoke about each of these within the context of his extended family—his wife Eleanor, son Roman and daughter Sofia, oldest granddaughter Gia and too many other grandchildren to name—sharing family photos, reminiscences and even beautifully written songs dedicated to his granddaughters. Maybe not so strangely Coppola's films were often discussed as mere mile markers to identify different stops along the way—Apocalypse Now to remind us of his time in the Philippines, One From the Heart as the failed picture that nearly lost him his estate, Godfather III and Dracula as the final two films he worked on as part of a deal with his bank to get out of debt. Here was the master showman working the crowd of film and wine lovers, cross-promoting his various products, and doing it in the most open and intimate of settings. He even opened up the floor to questions for approximately another hour afterwards, congenially letting one reporter get away with asking him a five-part question and joking that he wanted to limit it to just four-part queries. The Q&A session did yield some interesting news for film buffs. Coppola is currently writing a mysterious, multi-part film saga. And now that additional footage has been unearthed, he plans to re-release Abel Gance's Napoleon, potentially with unused musical material by his late father Carmine, who scored the US restoration in the early 80s (Filmicability's Dean Treadway goes into more detail here). What's most disconcerting is not that Coppola was kicking off a sort of whistle-stop tour of the country to promote his familiar brand. Nor was it that he seems to enjoy talking with his audience as much as they enjoyed listening to him. No, what felt oddest about this event is just how comfortable Coppola appeared as the newly installed impresario of a stable, self-financing business empire which appears destined to outlast even his grandchildren. Best known as an ever-struggling dreamer who routinely risked his own finances on questionable ventures like his studio American Zoetrope or expensive movies that make even the most auteur-friendly studios skittish, Coppola now contemplates the impending possibility of great-grandchildren as a kind of immortality... perhaps a better one than the cinematic one he's always sought. With his newest films getting very small promotional pushes, one can only wonder if he now views the winery and its attendant byproducts as his primary legacy, relegating his troubled filmmaking career to the category of more of an inspired avocation into which he channels his talent.